Thank you to everyone who has taken the time to contact us. Your positive feedback and success stories are what keep us striving to get even better! ColdCure® and BFST® are FDA Registered medical devices. The fact that our products are FDA Registered means that the authenticity of our testimonials is verified, so we cannot post fake testimonials. 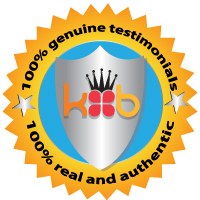 The testimonials below are 100% genuine and each one is associated with a real customer. Again, the statements below are real testimonials that can be tied back to real customers and their orders. I think they are really quite wonderful. I like them. I love the product and It has worked to help with the Bakers Cyst I have behind my knee and have shared the website with multiple friends. Thank you for taking the time to explain everything so clearly and carefully. I truly appreciate it. It's just a really good product it relieves the bakers cyst I'm very happy with it.In fact I took it to my orthopedic doctor and showed it to him and he was glad that I found such a product. I've showed it to some other people that I know have knee problems and I think everyone's pretty enthusiastic about it. I like the product, it's very good. I ordered your product and have been using things for about a week and things are going well. I can tell that I'm having decreased fluid I didn't know how that was going to happen, my doctor wanted me to go get it drained and take Naprosyn and see a pain specialist but I told her I was going to hold off on that because I knew this was coming in the mail. I'm not taking Naprosyn cause the cold packs are helping out and I'm not using them every day now because I read the directions and the pain has really diminished but boy for a whole month before I even went to the doctor it was horrible. I'm very pleased with that, that's why I keep come back and buying. It's working very well. Being FDA Registered also means that our products meet very high biocompatibility standards. This is what sets our products apart from regular consumer goods. Our products are made entirely from biocompatible materials, meaning it is completely safe if the materials come into contact with your body tissue, unlike regular consumer goods which are not made with biocompatible materials. This is especially important post-surgery, because you don't want fibers from a non-biocompatible product coming into contact with your healing tissue. Our products meet the highest standards and regulatory requirements for Class I & Class II medical devices. We have done a lot of work to bring you medical devices that are both safe and effective, because we believe you deserve the absolute best treatment for your injury. Megan was very helpful and very thorough on it and not pushy. Shes the kind of people I can deal with and I just want to tell you she was very good. It works very well, I'm feeling great. In fact I've told a couple people about your products. You guys are a wonderful customer-oriented company. Thank you so much for your fantastic customer service!! I really like it, I think it's the best cold wrap that I've purchased. Absolutely outstanding! We had no doubt. It's great, it works really well cause I had a slight injury with the back of my leg and so it works really well. Thank you for such great customer service, this is wonderful. My wife loves it, she says it's outstanding and she's very very very pleased with it. We think it is an outstanding product, she absolutely loves it. I want to compliment you, I was absolutely impressed with the speed in which I received the package. I used the cold, they worked wonderfully. I'm on the knee heat thing now and it's getting better and I really like the tape. I had a spot on my elbow and a spot on my neck so I put some up there to and by golly, who would ever think that something so simple little product like that working so well. I really appreciate that too. Your ice pack is fantastic. You just wrap it around and it's great, it's really like.... its great! Its helping me out a bunch. My knees healing up pretty good now! They're great I love them! You got them to me in a timely manner and they work really well. Ive been using the system for a hamstring injury and have been very, very pleased with the results. Considering the injury the pain went away fairly quickly after using the system. Am continuing to use it as suggested in spite of pain being basically gone. You have a great system and a great product and I'm happy to recommend you guys to anyone who needs it. I love your products. And I have sent your website to two people. I'm using the ColdCure right now and it's already made a difference in the swelling, so I am very happy with it and I appreciate the company getting it out to me so quick. I couldn't believe it came the very next day within 24 hours. You people are so professional. I agree that your guys' cold wrap is much better and last longer. Excellent help for my recent problems with my left leg. I just keep moving it from spot to spot and rotating with ice. i want to thank you for all the help you gave me over the phone. I really wish things had worked out well.I think your company is beautiful,you sure know the way they should be run.King is surely a pleasure to deal with. thank you again. I've been using the BFST regularly. I tore a calf muscle and I went from not being able to walk and now I'm walking almost without a limp! Started using BFST and woke up feeling better the next day. This is promising. I like the way I can do it with these products, its great. I'm already starting to feel improvement. I have been using it for about 2 months now & I can't begin to tell you how much it has improved my torn meniscus issue. I will be playing Pickleball again really soon & will continue to use the BFST before playing & if necessary will use the Cold Cure treatment after my game. Packaged good and it definately wraps my thigh very good. I used it with playing softball and it works good. Good support and good material. I really love your product and I truly feel that it has been very critical in my healing process. You product is really amazing!! just after few days I could see huge improvement ! Thanks again. It's a great product! It is amazing. My severe right leg cramps in the morning the doctors can find no real reason for it went away the first morning I used the pad. No screaming in pain for me and a ton of ice. Have used now for seven mornings and had zero pain with 20 minutes use. Best $150 I ever spent. my husband is using it and has had good success with it. He has a knee surgery and I used it on my back so we are sharing it now. It seems to be good for several body parts! Having spent hundreds of pounds (Dollars) on physiotherapy treatment that did not work I started using King Brand BFST products and my injury has already started to respond. I now own three BFST wraps ankle, foot and leg and would recommend them to all runners and cyclists. It's wonderful. I just love it! I think the product is great. I like that it comes with three gel packs, makes it very convenient for use when one gel pack warms up. I think it is working, I am able to do more with it then before, I've been using it for a week or so, it feels good using it too. I'm glad you provide that product because it is really helpful. I am very happy to endorse the ColdCure & BFST Leg Wrap. I suffered a torn calf muscle, grade 2, high up on the gastrocnemius muscle and deep in the muscle. This was the second time with the first injury coming in June 2014. Both injuries were due to simply taking a step to run while playing softball. No major stress on the leg, yet the torn muscle happened anyway. I did not seek treatment for the first injury and the injury lingered. I am sure that is what led to the second injury. I was desperate to not only treat the problem with the current injury but to also work to keep it from happening again. I had fairly extensive bleeding in the leg from the latest injury. I saw a sports medicine doctor and had an ultrasound. The severity of the tear was confirmed with no DVT. The doctor wanted me to follow-up with PT at the sports medicine office. Then I discovered these two wonderful products. The cold wrap served to treat the pain and immediately helped reduce the bleeding. It was so much more functional and useful then the bags of ice I was using. I also felt like I was fighting back to heal my leg and doing so quickly. The alternate use of the heat wrap felt so good. Within a week there was no pain and I actually felt like the leg was healing. It has been a little over 4 weeks now and I am ready to go. There has been a lot of rain in my area so my softball games have been canceled but I know I will be able to play and enjoy myself with a healthy calf muscle thanks to these wonderful products. I can run stairs on my toes and that definitely tests the injured muscle but with no ill effect. I will continue to use the heat and cold treatment from now on as part of routine care for my legs, not just the one calf muscle. When you think of the time and money spent to get physical therapy, and that it generally does the same thing for you, this is a great purchase. You can use the wraps whenever you need to or want to and in the comfort of your home. They work! Doing very well. No questions at this time. Very pleased with it. It's a lot better! I've used the BFST on it and the biggest thing I used was the ice packs. What I did I just take it, with a pair of jeans on and put my foot up and put it on the backside of the leg. I had a baker's cyst, it apparently has gone down and I can bend my leg now with no pain. About 10 years ago I had a baker's cyst and it broke and it went down my leg and it hurt like heck. I have used the BFST on my other knee, I hurt it back when I was 20 years old. I tripped over a little guy in a skating rink and pushed the knee cap up my leg. I just pushed it back down and kept on going and never had anything done with it. I'm pleased I can at least walk on it now, before I couldn't put any weight on it at all. I appreciate it! The gel packs have helped so much with my baker's cyst. I have recommended it many others. t is doing good, thank you. I have been using it and it is working good. It's awsome, I love it! It has made a huge difference. I love everything I got for you guys! I feel like I'm actually healing now. Thank you so much. Your products have really helped me. It works! I used the bfst 3 times yesterday and this morning I felt the best I have in a month! I actually slept last night! Thank you very much, Janis! All of the customer service representatives at King Brand provide exceptional service! You guys are great. Every time I've called with questions you have been right there and very helpful. Thank you so much for making this product. It has already been helping a lot. Everything is going really really well. I like them a lot! I love them. They fit great. I will be telling all my friends about them! Wow I took a shot ordering your product. It really works !!! Thank you !!! I was so impressed with your website! I learned more about Baker's Cysts and how to treat them from your site than from any doctor I talked to. I am impressed with how everything is working between the gel packs and the BFST. I wish that they would have offered this product as part of my post knee surgery rather than me having to explore for myself. I am just glad that I came across this product, I think it is perfect for what I was needing. We love your products! They are amazing and we share them with all of our friends. Thank you, the wrap is amazing! I have been using the wrap for only the week 2 times a day and have noticed a significant difference in my Bakers Cyst. Many thanks for the great customer service. I just love your wraps. I think they are wonderful! I just wanted to say that I have been using the BFST and am feeling tremendous improvement in range of motion. My baker's cyst is still present so I am still continuing to do cold in conjunction with my BFST treatments. I am so happy to finally feel improvement and that I can almost fully bend my knee, not a full squat yet but I'm getting there!! I would just like to say thank you! Oct 20- Spoke with Carol and she is LOVING IT!!!! Everyone wonders when they order on line what the quality of the product they receive will be. I can personally attest to the high quality of King Brands products. I have purchase five of their products and all of them exceeded my expectations in quality, performance and results. If you are using a drugstore heating pad to treat an injury, I can tell you that you will be amazed at how much more even, controlled and deep the heating from these wraps is. The gel packs are like nothing Ive ever seen. They are sturdy, the get is uniform thickness, it stays that way and they stay cold for much longer than the 20 minutes you will use them. They freeze quickly and they are so much better than gel packs you can buy over the counter. My left knee is bone to bone on the anterior side. After using the knee wraps for two weeks now, I have less pain than I have had for the last 2 ½ years. I am back on the golf course, too. Its clear to me that the improved blood circulation to the surrounding tissue is helping me. I could not be happier with these products. I really appreciate the call. I never had a company follow up like that before. You are better than any other doctor I have spoken with. Thank you. You guys are amazing. I think the courtesy call is a very nice touch, thank you. Just to give an update, my knee feels so much better now. I use the wrap 2-3 times a day and it's helped me immensely. I am very happy with the wrap. I also would like to acknowledge you and the company for this outstanding customer service. It is truly appreciated. I really appreciate the follow up call. Most companies only care about getting your money and never bother with you again. I am very impressed that you guys care enough to call. Thank you. Wow, thanks for responding so quickly! You have great customer service! I am very happy with it. It is exactly what the doctor ordered. Was taking antibiotics that can tear tendons. Using BFST has improved the area. I think it is a great product! I really like it a lot! Great at home product. It's awesome, it's great, I love it! I purchased the King Brand ColdCure Leg Wrap for my husband, Larry Perez. I am happy to provide positive feedback regarding your products and service. You may use any of the statements below as testimony. •The Customer Service Rep, Stu, was very knowledgeable about which products to use for my husband's diagnosed condition: Baker's Cyst •He thoroughly explained the ColdCure technology and how to use the 'cold refrigerated' therapy for all day comfort without risk of 'freezer burn' from ice therapy. •Having the (3) gel packs to rotate is such a simple and wonderfully beneficial process. •The ColdCure Leg Wrap is an EASY to use, very FLEXIBLE wrap that stays SECURELY in place. This treatment has brought immense relief to my husband. Note from KB WebMaster - The text below is primarily intended to assist with Google properly classifying this page content. To learn more about our products please visit our website.<br>The testimonials on this page are for our BFST and ColdCure medical devices. These are 100% geniune testimonials. Our testimonials are real and each one is associated with a real customer. These statements are real and can be tied back to real customers and their orders. Since our medical devices are FDA Registered, we cannot post fake testimonials. These testimonials are 100% real and authentic. Thank you to everyone who has taken the time to contact us.